Rhett’s and my formal introduction began in Tennessee in Aug 2013, although I am convinced that our first introduction began much earlier, well over a year before. A long time mentor and friend asked me a question a year prior when I was riding with her in a clinic. 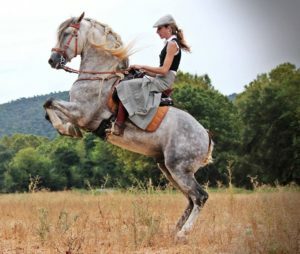 “With your and Sage’s* horsemanship improvement, I’m curious if you’ve given any thought to what type of horse you might like for your next mount?”. My. Next. Mount?? What’s wrong with the one I have right now?? Sure, I know my redheaded quarter horse mare, Sage, is almost 19 years old, but she’s ‘The Firecracker’! “Don’t you want to learn to ride bigger movements on a horse with lots of suspension? We all love Sage, but you have taken her about as far as she is mentally and physically capable”, my mentor remarked. I really had never given another horse any thought at ALL, until now ! 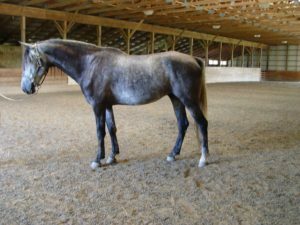 My mentor’s words kept flowing in and out of my mind over the week I spent with her – “Have you given any thought to what type of horse you might like for your next mount?” I pretty much had only quarter horses and quarter horse crosses for over 50+ years, why would I start with another breed? I saw this mentor in the fall and again, she asked if I had thought about what breed I might like next. Hmmm?? Type? Breed? She had called them two different things, type or breed. Were they the same for me on my journey? I let my mind wander to the possibilities. I really had never given it any thought. Don’t fix something that’s not broken, quarter horses rock! 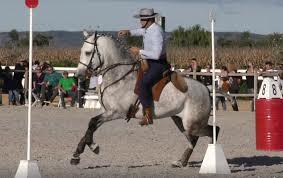 When I began to think about it and closed my eyes, an Iberian cross or Spanish breed, was the first to drift in. 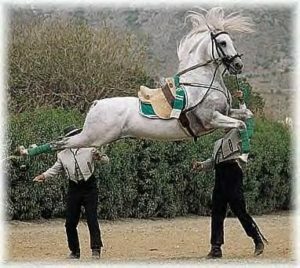 I really didn’t know a lot about ‘Iberians’ or Spanish horses, except having seen the “Lipizzan Stallions” from the Spanish Riding School. In my initial research, I consistently liked the way they moved and they seemed to have really good minds. Working Equitation and Dressage, of course, drew my attention. 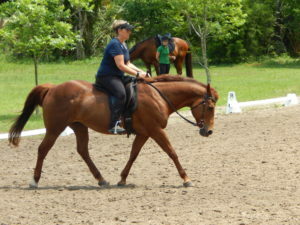 It looked fun and a good fitness program for both me and the horse. WAIT a minute…THE HORSE? THE HORSE? THE denotes ‘A’ horse is in existence! From that point forward, I dreamed of a grey white bullfighting horse of Iberian descent. A grey white supple bodied and brilliantly minded bullfighting horse. 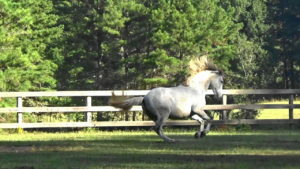 A grey white stallion performing airs above the ground. 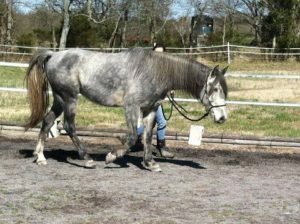 A grey white ‘schoolmaster-ish’ horse that would support me through learning to ride higher movements. The more I thought about it, the clearer and more real the horse developed in my dreams. The dreams became more vivid, more possible and more attainable. Now, I realize it was Rhett, though that wasn’t his name of course, that kept coming to me in my nightly dreams. He was the most magnificent horse I’d ever seen. He had the most incredible movement. 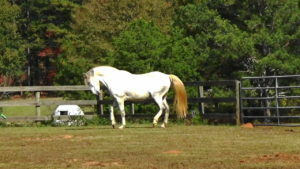 He was brave and faced down the ‘bears’ at the obstacles in the working equitation arena. He lived for the dance with the bull. He loved people and would run faster than any other horse in his herd to be admired first. 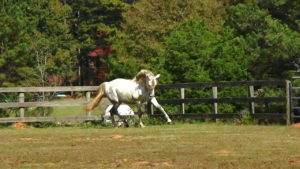 My Rhett was THE perfect Horse! I casually mentioned it to several of my horse galpals. In July 2013, one of those friends mentioned an Iberian cross a friend of hers was fostering and was looking for his forever home. Three BFF’s decided to take a “Girls Road Trip” to TN to meet ‘The Horse’. Arrangements were made to meet him a couple hours daily over 2-3 days to ‘test’ him for my purpose. And in my mind, my purpose was clear and succinct. 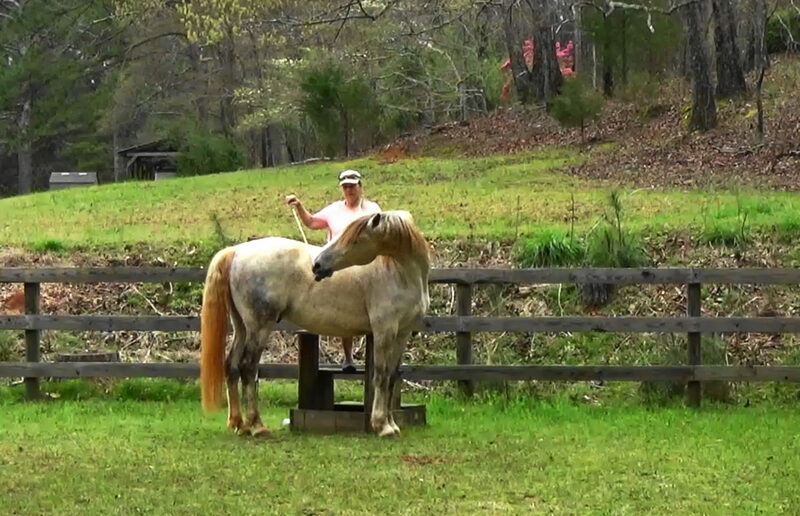 When we arrived at the foster barn, I was hit with reality….